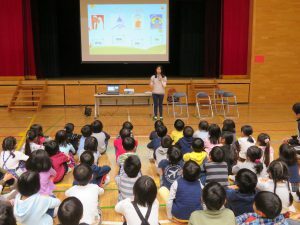 ASEAN-Japan Centre conducted a school-visit to Oyaguchi Elementary School. 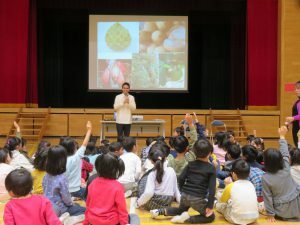 In the school-visit program, Indonesian and Filipino nationals living in Japan introduced their home countries to two classes of the 1st grade students. The students learned about the two countries through the presentations by lecturers and cultural experiences. In the lecture of Indonesia, food, traditional costume, tourism destinations and Indonesian language were introduced. Then the lecturer performed and taught the students the Indonesian traditional dance. In the lecture of the Philippines, fruits, flowers, animals that symbolize the Philippines were introduced with the history and the lives of people in the Philippines. Also the lecturer shared a Filipino song and the students sang together. The students enthusiastically asked questions to the lecturers in the Q&A session.